The last time I wrote about HAL JORDAN AND THE GREEN LANTERN CORPS, they were neck deep in a face off with the one-man-corps himself: Larfleeze, bearer of the orange ring of avarice. But as you’ve probably surmised, there’s more to the universal spectrum than just green and orange. Quite a bit more, in fact. And don’t worry, if you stick around in the Green Lantern universe long enough, you’ll get to know them all pretty well. But right now, we’re going to dramatically shift gears from greed to a more positive emotion. It’s time to embrace your inner optimist and learn about the blue light of hope. Welcome to Blue Lantern Corps 101. 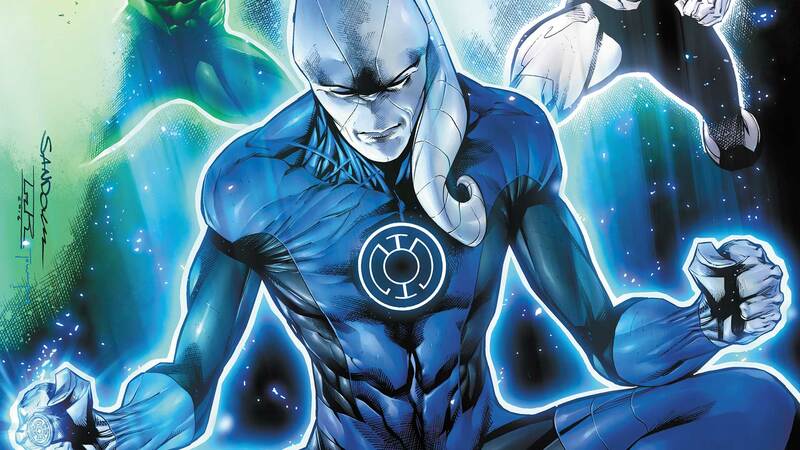 The Blue Lanterns officially came to be after the Guardians exiled two of their own—Ganthet and Sayd—for challenging the conformity of their peers. Ganthet and Sayd ended up settling on the planet Oydm, where they used their power to forge the very first Blue power ring in an effort to bring hope back to a galaxy that had so recently been brought to it’s knees by the Sinestro Corps War. Of course, making a power battery and a ring to channel a color on the emotional spectrum is only one part of the process. They needed someone to actually wield it to actually make a difference. Enter “Saint” Bro’Dee Walker, a priest from a planet called Astonia. Walker’s life was anything but easy—Astonia’s sun was dying and the cataclysm was primed and ready to exterminate everyone who lived there. But even in the face of insurmountable terror, Walker refused to give up hope for a solution, and in the sun’s final days, climbed to the top of a mountain to pray for deliverance for his people. The deliverance from on high didn’t come—at least not in the way Walker would have expected—but it just so happened that, at that very moment, Ganthet and Sayd had sent out their newly crafted blue ring in search of a person hopeful enough to wield it. Thus, the Blue Lantern Corps were officially born, with Saint Walker their first member. Walker used his newfound power to, essentially, “rewind” the sun and avert the looming death of Astonia, though, heartbreakingly, he was too late to save his own family in the process. Of course, one man doesn’t constitute a corps (...unless your name is Larfleeze), so Walker’s first real mission was finding a second ring bearer. The Blue Corps is unique in that it doesn’t send rings out into the galaxy to search for wearers independently in each sector. Instead, it functions almost like a secret society. New members are selected by existing members and put through a rigorous series of tests to become fully initiated. It’s a little like “Fight Club,” if “Fight Club” were about spreading peace and hope across the universe. ...Okay, maybe it’s not like “Fight Club” at all. Saint Walker’s first initiate was named Warth (later called “Brother” Warth once he became a Lantern), Warth then selected Brother Hymn...and so the pattern went until the Blue Corps was a functioning body of ring bearers. The actual power of the blue ring is unique from the other colors on the emotional spectrum as well. Rather than creating constructs of their own, Blue Lanterns “boost” the power of Green rings (usually by a huge factor, sometimes more than doubling their original capacity) and nullify the power of Red rings. In fact, the power of a Blue ring is the only known way to safely remove a Red ring from a Red Lantern without killing the ring’s wearer. This makes Blue Lanterns a tremendous ally and asset for the Green Lantern Corps, especially when they find themselves facing threats that may otherwise be totally insurmountable to just willpower alone. During one such nearly insurmountable conflict, the Blue Lanterns even saw to it to deputize a human from sector 2814 as a temporary Blue Lantern. He might be pretty familiar to you—his name is Barry Allen and he’s been known to be pretty quick on his feet. Maybe even the Fastest Man Alive? Does that sound familiar at all? Unfortunately, not all that long after the catastrophic events of BLACKEST NIGHT, the Blue Lantern Corps all but disappeared. Hope itself somehow flickered out of the universe, almost completely...which brings us to the present day where, in HAL JORDAN AND THE GREEN LANTERN CORPS VOL 3: QUEST FOR HOPE, members of the GLC go out in search of—you guessed it!—the lost members of the Blue Lantern Corps. It’s unlikely to be quite as easy as finding Saint Walker and asking him to rejoin the fight, however. After all, like all things in the galaxy, even the power of hope has a price. If you’re a trade waiter, you can now find out if all will truly, finally, be well. Hal Jordan and the Green Lantern Corps Vol. 3: Quest for Hope is now on shelves everywhere books are sold! HAL JORDAN AND THE GREEN LANTERN CORPS VOL. 3: QUEST FOR HOPE by Robert Venditti, Ethan Van Sciver, Rafa Sandoval and Jordi Tarragona is now available in print and as a digital download.